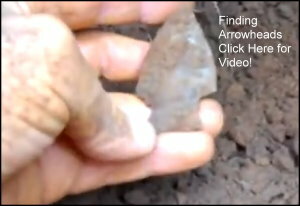 Washita Indian Arrowheads along the Ouachita River, Mena, Arkansas. The Ouachita Renegade Ranch has a large field that was the site of an ancient American Indian Tribe. The Washita Valley Indian Tribes began to disappear in the 1600’s. The Washita Tribe battled the Tensas Tribe and later the Chickasaw Tribe. By the 1690’s the Washita Tribe had been entirely driven out. 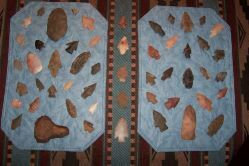 Artifacts such as arrowheads, spearheads, and more can be found in the large meadow of Renegade Ranch, and serve as witness to the noble warriors that lived along the Ouachita River in the Ouachita Mountains of Arkansas and Oklahoma. We keep the Arrowhead field plowed to make it easier for you to find a treasure to take home. Shovels and Sifters are available or bring your own. 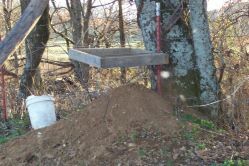 You can dig for a half day, a whole day or a week. 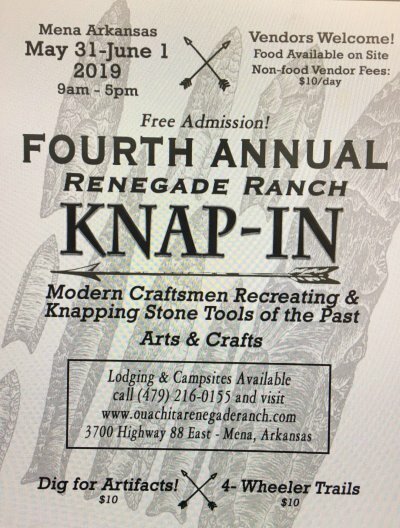 The Third Annual Renegade Ranch “KNAP-IN”. Stone Tools of the Past.